Time to talk Snakemen, as Defiant Elk takes control of the story! The snakemen aren’t the last option for the Elders to discuss. Mittie shows us what else is being considered when you vote for Snow by Night on Top Web Comics. Bounce, bounce, bounce! Stop girling up the story with your cute bears! 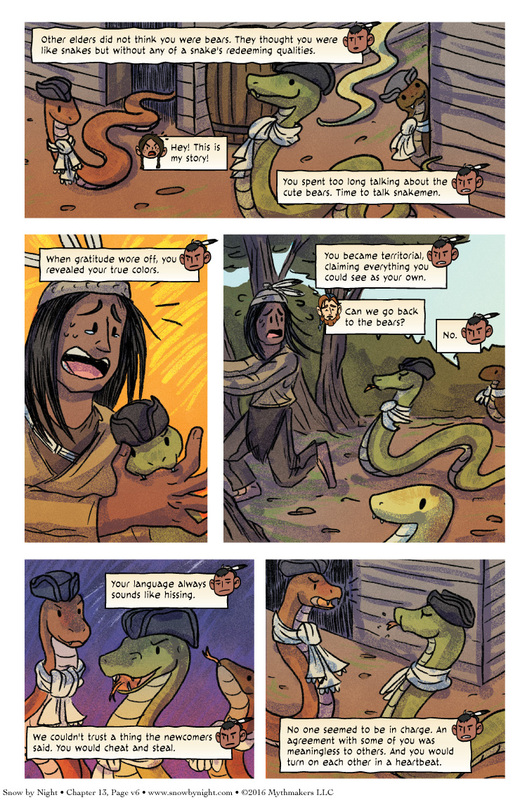 The green snake in the last panel looks like it’s blowing a raspberry. Yeah Hissing contests are an accurate global statement. Attorney doesn’t carry any valubles. Sorry, Elk, but your snakes are even cuter than Kit’s bears. I was wondering if they decided for people more for the bear qualities or the snake qualities . . . then I saw the voting incentive . . .
Got to admit the snakes are cute, and no one in charge…oh boy.